What is the benefits of rabbit (Tuotu): 3-3 is the first in the fourth generation multi-use download/upload engine downloading software Rabbit (TuoTu) from three beautiful interface, easy operation and abundant resources to allow users the usage more handy. From TuoTu with three popular download software integrations - the biggest difference is that TuoTu (rabbit) from the original three is independent of each other to get through the transmission protocol. The implementation of each engine from different transmission (Torrent, Emule, HTTP/FTP) have in the source cleverly been solved. Various transmission protocol it's own deficiencies, which greatly improved the speed of downloading, The stability and effectiveness of resources. In future, users don't need different filesharing programs as BT, eMule, HTTP,... Download Managers. One download tool and setup, TuoTu (rabbit) Installation have all in one. You will be able to quick and easy download. The program search on Emule network and BitTorrent net for sources of the same file by downloading/sharing. It comes with a preconfig startpage in TuoTu's Webbrowser with a large range of available Downloads allready. Of couse you can use every BiTorrent site and download sources. Some Links are here. 1. Config Windows that it can show Chinese Letters. 2. 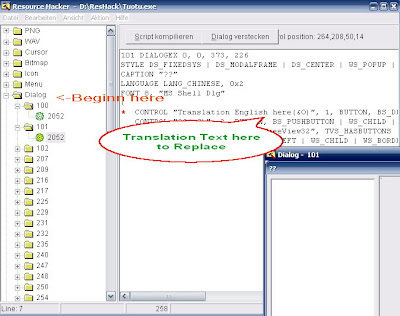 Download ResHacker (English) - (German) and open the program exe with it. save backups between and test the result after compiling a dialog/menu. see Screenshot: Please Post your Results. We can't do it our OS isn't Windows. If you have Windows OS, the East Language Support should not be ripped if it's a slipstreamed Windows Installation Version. e.g: The Movie "FUR" RMVB (RealMedia Video/Audio) File: ____(bbs.cnxp.com).__.Fur.2006.rmvb size: 526 MB. Converted with Ultra RM Converter to XviD about the same size but less quality as rmvb (near VCD), converted with WinAVI Converter to XviD about ~1700 MB no visuale lost of quality (near DVD). Super Video Convertor and co. names (Witcobber) doesn't convert the audio stream synchrone. Real Media Movies can contain some Advertisments and Websites goes open by watching. The conversation progress remove it. The emule.dll (seems to be a ripped emule.exe program) emule.exe v0.47c It might be possible to replace it with any emule mod if you do the Ressources from emule.dll (comes with TuoTu), save with Reshacker and put in the Emule mod of your choice, save emule.exe as emule.dll and replace it in TuoTu install folder.